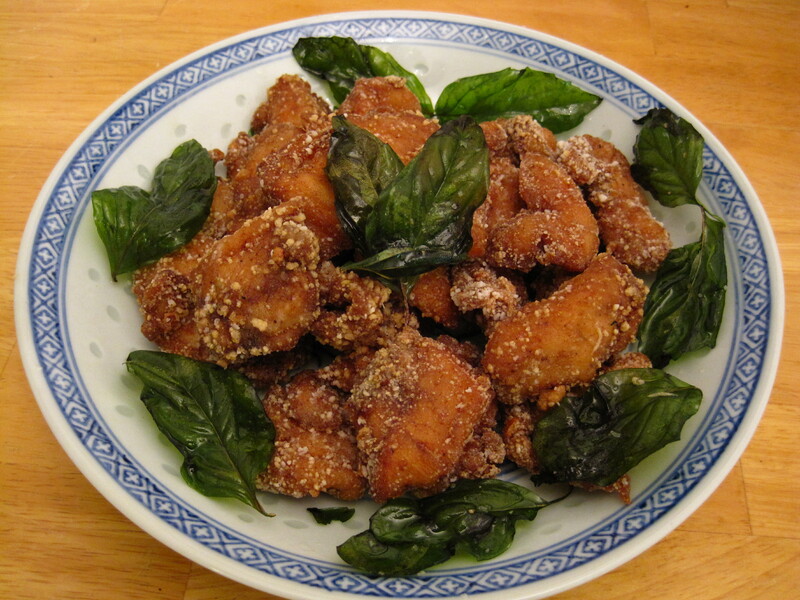 This Taiwanese popcorn chicken dish is called salt pepper chicken in Chinese (yan su ji). It makes for a delicious snack or it can be served with rice for dinner. My family used to order this every time we went to a particular Chinese restaurant in Markham, ON. It was so good that we sometimes ordered two of them. 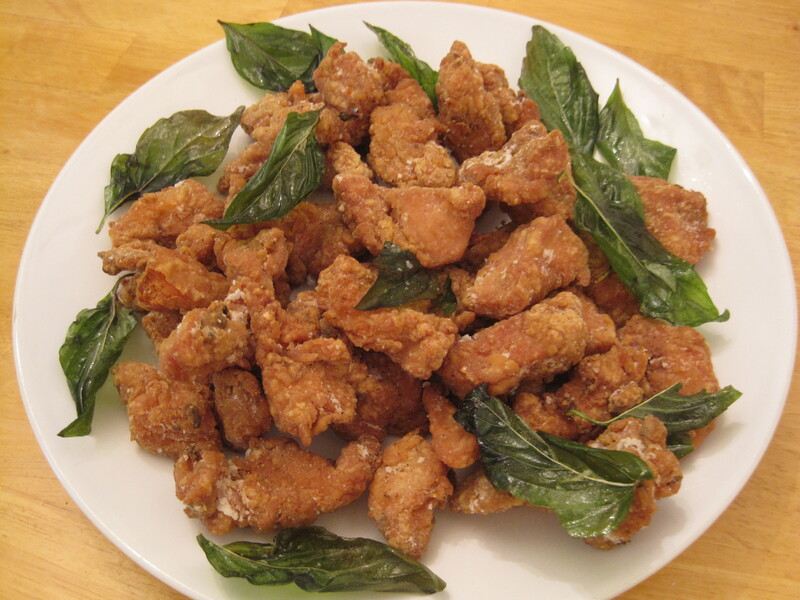 The best part of this dish is the garnish – deep fried thai basil leaves. Even though I haven’t had it in a very long time, I still think about it from time to time. So I finally got around to making it for myself. In the authentic version, Asian five spice powder is dominant, but personally I prefer to reduce it. Note: This recipe was recently updated and improved! In a small bowl, combine the salt, white pepper and black pepper. In a larger bowl, mix together the chicken, garlic, ginger, soy sauce, shaoxing wine, sesame oil, five spice powder, sugar and 3/4 tsp of the salt and pepper mixture. Marinate for at least 30 minutes. Using a deep fryer or a wok or a large pot, heat the oil to 350 F over medium heat. While you’re waiting for the oil to heat up, mix together the sweet potato starch and cornstarch in a wide mouthed bowl and coat each piece of chicken with it. Make sure that each piece is well coated. Set the chicken aside on a plate. Then when the oil is hot, deep fry the chicken until golden brown and just cooked through, between 2 and 4 minutes. Do not overcook the chicken. Using a slotted spoon (I use a Chinese wire strainer), transfer to a paper bag lined plate. Note: I use brown paper bags because I find that paper towels make deep fried foods soggy. Then raise the temperature of the oil to 375 F. Return the deep fried chicken pieces to the oil until very crispy, about 1 minute. Use a slotted spoon or Chinese wire strainer to transfer the chicken pieces to a clean, paper bag lined plate and immediately sprinkle the remaining salt and pepper mixture onto the chicken. Then deep fry the thai basil leaves until they are crispy (ie. when they stop sizzling, about 10 seconds). Transfer to a paper bag lined plate and immediately sprinkle generously with salt. Optional: Deep fry thinly sliced garlic cloves until golden brown and crispy for additional garnish. Transfer the chicken to a clean plate, garnish with the thai basil leaves (and garlic if using), and serve immediately with rice. This dish needs to be eaten while still very hot and crispy. I would love to say thank youat least for a mind blasting thoughts. Awesome! I always wondered what they put on them. Now if all the Quickly’s shut-down I will still have a way to get my fix. Thanks so much for your comment! Tapioca starch would work great too! Where in Markham has the best Yan Su Ji? Unfortunately, the restaurant that made my favourite Yan Su Ji is closed now. I haven’t found a good one since. Please let me know if you have any recommendations!